JIMMIE RODGERS: In a career that barely lasted six years, combining the Blues, Jazz, popular stylings, rebellion, and religion, Jimmie Rodgers will be remembered as the man who introduced the first great American music. He is "The Father of Country Music." James Charles Rodgers was born September 8, 1897. Jimmie, the son of a Mobile & Ohio railroad section foreman, soon found a fascination with music and by age twelve had won his first amateur talent contest. Leaving school two years later he became a water carrier for the Mobile & Ohio. 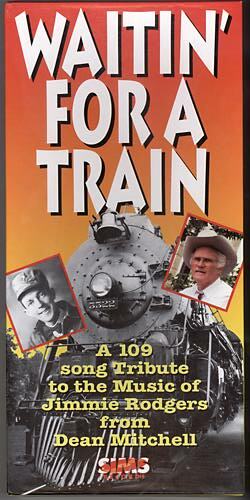 Jimmie worked various jobs for the railroad including brakeman, as well as other odd jobs while pursuing his interest in music. In 1925 he joined a medicine show performing in black face and a year later began yodeling with guitarist Ernest Helton. Soon afterward, Jimmie and his wife Carrie moved to Ashville, NC. There he formed a hillbilly band, the Jimmie Rodgers Entertainers, and in 1927 began broadcasting on WWNC. This group included Jack Pierce on guitar, Jack Grant on mandolin and banjo, with Claude Grant and Jimmie on banjo as well. When Jimmie learned that Ralph Peer from Victor Records had set up a portable studio in Bristol, Tennessee, he and the band were on their way. After arriving, the group broke up following a dispute and Jimmie found himself all alone. Determined not to fail, he took his guitar and recorded "Sleep Baby Sleep" and "The Soldiers Sweetheart." These cuts were released in october 1927 along with the first recordings of the Carter Family. Jimmie's songs hit with instant success. Soon he was back recording more songs. "T for Texas," originally issued as the "Blue Yodel," became a million seller and by 1928 Jimmie, now known as the Blue Yodeler, had become country music's first super star. Within a year of the release of "T for Texas," he was broadcasting from the nation's capital on WTFF and headlining a vaudeville tour on the Loew Circuit. With his added success, Jimmie began to experiment with various styles of musical innovation, recording with Hawaiian musicians, whistlers, and jazz musicians like Louis Armstrong and Clifford Gibson. He kept up his hectic schedule in 1929 by headlining another vaudeville tour, broadcasting from major cities, and recording up to five sessions a year. In 1931 Jimmie joined Will Rodgers to aid drought victims on a tour of the Southeast, and 1932, found himself hosting two weekly radio shows on San Antonio's KMAC. By early 1933, after years of illnesses, Jimmie was hospitalized with tuberculosis. Though sick, he returned to New York to lay down some new songs for Victor, resting on a cot between takes. He recorded an amazing twelve sides in eight days including such prophetic songs as "I'm Free From that Chain Gang Now," "Yodeling My Way Back Home," and "Woman Make a Fool Out of Me," which was released as "Jimmie Rodgers Last Blue Yodel." The final song "Fifteen Years Ago Today" was cut on May 24, 1933. The following day Jimmie hemorrhaged and lapsed into a comma from which he would never recover. On May 26, 1933 in the Taft Motel, Jimmie Rodgers died at the age of 35. In 1961, as the crowning achievement for a brief but monumental career, Jimmie, along with Fred Rose and Hank Williams, was inducted into the Country Music Hall of Fame. Experience the music that is Jimmie Rodgers. DEAN MITCHELL: Growing up on a farm in Northern Alabama, Dean Mitchell began to fall in love with music as he was influenced by the South's most enduring musical traditions, country and gospel music. Dean began singing at an early age from the Sacred harp song books at church. Tuning into WCKY radio out of Cincinnati, Ohio, he was able to listen to Jimmie Rodgers, Wayne Rainey, Ernest Tubb, Roy Acuff and many others. Since that time Dean has recorded several albums and developed into an artist that has maintained a regional, national, and international profile through radio, television, and personal appearances. Dean received an endorsement from one of his heros, Ernest Tubb, which led to his being accepted on the touring roster of the Alabama State Council on the Arts (the first Country artist to be listed there). He has toured the U.S. as well as England, Ireland, the British West Indies, Canada, and Romania. 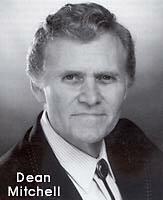 Dean has been a featured artist in several country and gospel music magazines. He has also appeared in a number of scholastic journals on the history of Country Music, including the Old Time Country Music magazine, published by The Center for the Study of Southern Culture at the University of Mississippi. Besides his guest appearances, Dean has also appeared in commercials, advertising his recordings on the TNN and USA Network. In 1996 Dean returned to the studio to record a collection of gospel songs he had written which reflect his sentiment on the social and moral challenges that our country faces today. Most recently Dean was inducted into the internet's Rockabilly Hall of Fame. Whether country or gospel music, Dean Mitchell has always presented songs that were timely and well delivered. This collection of Jimmie Rodgers' music is no exception. NOTE FROM THE PRODUCER: Over the past fifty years I have been privileged to work with some of the biggest names in country, rock, r&b, gospel, and bluegrass. 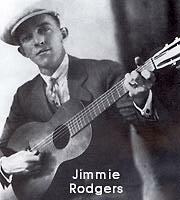 Time and time again I have been impressed by the impact of Jimmie Rodgers on the music industry. It would be impossible to calculate the number of artists and songwriters that Jimmie's music has influenced and continues to influence. It had been my long time dream to produce a collection containing all of the songs ever recorded by Jimmie Rodgers. In pursuing the creation of this box set, I felt there was only one artist who could capture the very soul and essence of Jimmie's music... that being Dean Mitchell. I am amazed at Dean's ability to emulate, with such a degree of accuracy, the style of Jimmie Rodgers. This 109 song collection is the ultimate definitive work on the musical genius of Jimmie Rodgers. I want you to kick back, listen, and enjoy this timeless music.